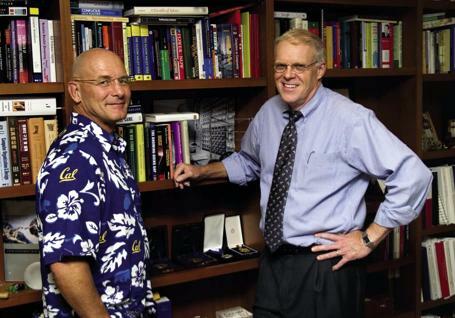 John Hennessy (of Stanford University) and David Patterson (of the University of Berkeley), authors of the extremely well known Computer Architecture: A Quantitative Approach book talk about the challenges of Parallel Processing in an excellent interview in this month’s ACM Queue magazine. “I think today this shift toward parallelism is being forced not by somebody with a great idea, but because we don’t know how to build hardware the conventional way anymore. This parallelism challenge involves a much broader community, and we have to get into applications and language design, and maybe even numerical analysis, not just compilers and operating systems. God knows who should be sitting around the table — but it’s a big table. “The fundamental problem is that we don’t have a really great solution. […] [H]ow we’re going to change our programming languages; what we can do in the architecture to mitigate the cost of various things, communication in particular, but synchronization as well. “On the other hand, there’s exciting stuff happening in software right now. In the open source movement, there are highly productive programming environments that are getting invented at pretty high levels. Everybody’s example is Ruby on Rails, a pretty different way to learn how to program. This is a brave new world where you can rapidly create an Internet service that is dealing with lots of users. This is a fantastic appreciation of Ruby‘s and Ruby on Rails’ potential, isn’t it? Is it me or does the guy on the left look like Patrick Stewart? dont worry, its a straight-forward one! exactly wht i was thinking..
there are legions of patrick stewarts out there. It’s a pan-galactic conspiracy. Next thing you know, you’ll be beamed up onto a starship of the line, a funny many with tight lips and pointy ears will entertain you with derivations of higher order propositional logic, then you’ll be jettisoned out in hyperspace. well, I’ll admit i didn’t read through the post completely nor did i read the full interview. But the title â€œRuby on Rails is a Big Thingâ€¦â€. Indeed Rails is a big thing, and it’ll probably become bigger than Ruby. The way i see it is that Rails is a technology that would interest the people who own/run/maintain websites with large volumes. So gradually(if not already), more emphasis will be put on developing Rails than Ruby. So effectively, Rails could be the tail that wags the dog. More people on rails, less on ruby. the development of each may start to go along different tracks(pun). In the end, there may be diverging(pun again) syntax popping up between Rails and Ruby. A bit like the many versions of Lisp. but the more negative the approach, the more room there is for positive improvement. Practical programming project for A Level Computing (Paper 2). programmed using a procedural or object-oriented programming language. enough to recommend my colleagues to do their project in it. why not use Ruby – the better python, as programming language for this paper. Ruby thouroughly and produce sample codes showing the above 8 skills. Hoping for a reply from your side. Ruby is a very good choice for the A-level project. I’ve already written about Ruby. It is a modern language with extremely powerful features. And it’s a joy to teach and to learn. (1) Yes! Ruby supports (i) arrays (ii) data types using classes (iii) if/unless statements (iii) while and extremely powerful iterators (iv) procedures (v) functions (vi) searching techniques – most Ruby collections support the find operation and you can easily write your own Quicksort or whatever (vii) files and all sorts of other streams. (2) In my opinion, Ruby is one of the easiest languages to learn for two reasons (i) it has a consistent and simple syntax and (ii) great tutorials and books are available freely online. (3) Yes! Ruby is extremely object oriented (everything is an object – like in Smalltalk). For me, it’s better than Java. And if you want to use the Java libraries, you can even use JRuby which is Ruby on the Java Virtual Machine.